If you had the pleasure of watching Eli Tomac throughout his amateur career, you know just how well he was able to master each and every event he participated in, during his younger years. From the likes of the World Mini’s, to the Winter National Olympics, and everywhere in between, Tomac was a true threat to win from his inception aboard the 50cc machine. However, if you look back to his performance during his last stint at Loretta Lynn’s Ranch (the year of 2009), you can see that he swept all six moto’s in a host of different conditions. There were multiple instances that year, where the track was absolutely dismantled with inches of rain, and a rising of the creek beside the track. 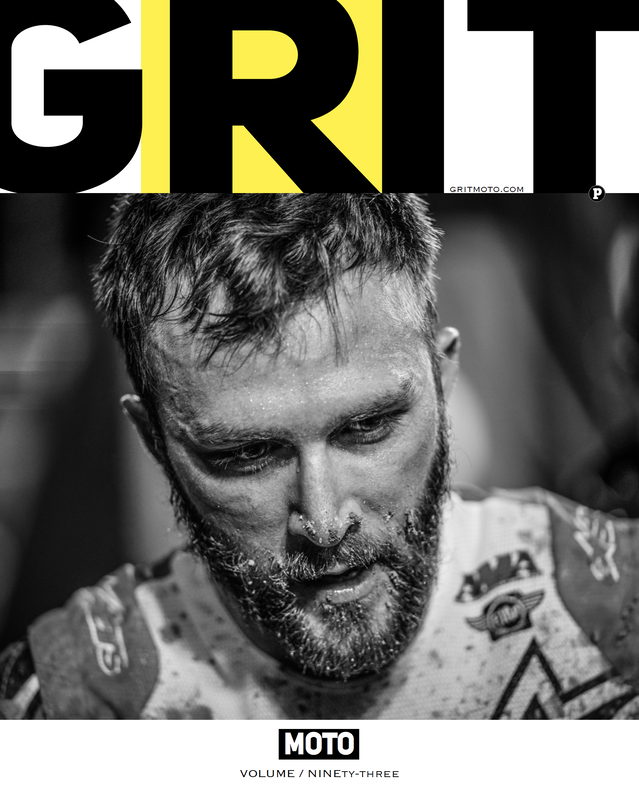 And where as many would flounder, Tomac would excel; hardly ever showing any sign of frustration, and almost forecasting his ability to handle any type of environment in which he was forced to compete in. Fast forward to the 2019 San Diego Supercross, where many of his competitors could be seen biting their nails and tapping their toes in bits of anxious anticipation. Tomac, situated aboard his number three Kawasaki for the heat race would gaze onto the start stretch; quietly zeroing in on his plan of assault. He would unleash his anguish at the expense of others around, getting off to a fourth place ride. Charging to the front, he watched, as others around him would begin to crumble; first it was Chisholm, followed by former amateur competitor, Justin Bogle. And once making his way around the two previously stated, he eyed rookie Aaron Plessinger on the last lap. Tomac, a carnivore growling at the piece of meat covered in blue hue, would snap at the number seven on the final circuit; Plessinger, doing everything in his power to hold on, couldn’t sustain the pace, and would forego the lead to the powerful Kawasaki combatant behind. The win would be Tomac’s. And despite all the chaos that loomed around the event and track itself, Eli’s focus was of Zen-like quality. Staying calm throughout the literal storm that would immerse the coliseum, Tomac would trek to an early lead. Bogle would be behind at first, but a faint echo of only lap traffic would begin to enter slither into his eardrum. Chatter of Roczen and Musquin coming through the pack would be ricocheted via the intracellular radio network, but Tomac’s channel would be speed-dialing his way to victory. It was he and mechanic working as a team, and albeit a brief hiccup where he stalled the motorcycle and was forced to restart; the race would be completed in perfect fashion. Eating roost only from lap traffic, Tomac would prance his way around this disastrous masterpiece, claiming a much needed win for the Kawasaki crew. As all fans have noticed throughout Marvin Musquin’s career here in the states, it’s as though the KTM rider excels when the tracks get tougher. The more one has to think, navigate, and plot his moves in analytical fashion, the further Marvin will climb up the leaderboard. As is the case when rains pour on the soils of San Diego, where Marvin knew that a bold strategy and swift movement patterns would place him in a strong finish, if things were to fall in his favor. He looked strong throughout practice, although he wasn’t on the track for very long. The rain would be so bad on this particular weekend, that every portion of track time (including the main events) would be cut short, due the outright brutality placed on the machines. And with the new rule changes being in effect, Marvin would place even more of an emphasis on the start; knowing that he wouldn’t have near as much time to make passes, if a bad start were to fall his way. He had an absolutely horrible jump off of the line to begin the night, with a dumping of the clutch, and the back end immediately sliding in horizontal fashion. It would cost him precious feet, in regards to the rest of the pack; yet somehow, he would squeeze his way into the top five as they completed lap one. Justin Bogle, who was at one point ahead of him, would crash in a right-handed corner; letting Musquin slip around, pushing him to fourth. Next up, the privateer Kyle Chisholm; who Musquin would work around on lap number five. Residing in third on the final go-around, Marvin would bring the number twenty-five around in third place, excited for the main event. A tenth place off the start wasn’t what the French rider had hoped for, but he would begin to work immediately as every second passed. Pushing his way quickly behind Ken Roczen on lap five, he could see a glimmer of the leaders when glancing across the track. He and Roczen had rode together in conditions like these on European soil, therefore he trusted Ken’s quick wittedness, and ability to navigate through lap traffic. And the trailing would pay off, as they both made their way around Justin Bogle on lap eleven; however, Marvin knew he had just a bit more left in the tank, and if he could somehow get to within striking distance on the final circuit, who knows what could happen. So he would make a charge just before the final corner; choosing to go inside, rather than follow Roczen down the middle. The gap would shorten, and continue doing so, until a climax of adrenaline would be reached! Roczen would take an abrupt stop during the halfway point of the section, with Musquin now moving into second! He’d worked his way from nearly outside the top ten, to salvage considerable points; finishing runner-up overall. “I got passed literally on the last straightaway; I’m definitely not happy I got passed there. Living in Germany for a large portion of his life thus far, Ken Roczen has spent many days at the track, saturated in rains from above. With tracks on that side of the pond, not necessarily being catered and tended to each particular riding day, Roczen was built on a framework of riding any course in front of him. Therefore, when the skies would open up and cast their fury on the state of California, for this first weekend of February, Roczen didn’t blink. He would reach deep into his toolbag, using all the tools of his youth in order to attack the track, as qualification would begin. Hitting as many doubles and triples possible, his rhythm through these ultra combed-out sections was actually rather impressive. He was jumping through these spaghetti filled transitions with a period of calm, cool, and collective manner; never once chopping the throttle with an ounce of hesitation. It would translate into the heat races as well, where an awesome jump off the line would position him at the head of the pack. With familiar foe Cooper Webb at his “6 o’clock” Roczen’s focus would remain on the forefront; searching for the smoothest and fastest line possible around this treacherous raceway. His chassis would dig into the meat of these sharp one eighty degree corners, looking to accelerate deep into the stadium floor as the soil beneath him would decay. He was building momentum and confidence, getting into a trance-like zone as the white flag would come about. And upon completion of the seven laps, he would take the win, eager for the main event to start. Fourth off the line, he could see the likes Tomac, Bogle, and Barcia just ahead. He knew he would have to make moves, and make them fast, if he wanted to repeat the success he displayed in the aforementioned heat race. Pushing his way into third, he would stalk Bogle quite sometime; before a mistake by the KTM rider would place the number ninety-four into second position. All seemed to be well, until the last lap; when a mishap within the rollers, within this thick, speed deterring slop would leave him a victim, while Marvin Musquin would work his way around. Third as he rolled the finish line double, Roczen was bound and determined to make his presence felt in the following round. The number ninety-four knew he couldn’t continue to let valuable points slip away. Coming into the 2019 season, Oklahoma’s Justin Bogle wasn’t too sure as to what he would be competing on, in regards to bike brand and sponsor support. Although a former champion, and even winning races in the 450 division in the past few years, the amount of factory rides in this sport are just too scarce at the moment; and unfortunately Bogle was on the outside looking in. However, with the injury of Benny Bloss, due to an unfortunate crash in the pre-season, Bogle was called to take his place aboard a KTM 450. Playing host to a position on the Rocky Mountain ATV team, Bogle feels as though he’s been given a second chance and has looked to take full advantage of it as the rounds have progressed. Known for his starting technique and sprint speed, he looked to put his full array of talent on display for this particular round; hoping to stay as smooth as silk, while pulling away from the field in the lead. And once the gate would fall for the heat race, he looked to set sail on the crowd behind. Pulling out to an early lead, you could see him navigate the course with a bit of finesse; sliding the rear wheel around the tight knit chicane section, in gentle fashion before exploding out of the exit with the throttle. He looked to pull away, until a mishap would result in him being on the ground and slipping back to fifth position. He would stay here for the duration of the moto, displeased with the mishap, but reassured in his effort of totality. Now, as the gate would fall for the main event, Bogle would somehow weasel his way into second position, after starting nearly two gates from the inside. Doing his best to latch onto Eli Tomac, you could see him skying over the “big” triple on the far side, and navigating the rollers to the best of his abilities. He seemed to hold the second position down in strong fashion, until a mistake would result in Roczen slipping by; luckily though, his lead had been stretched far enough that he had a bit of gap on the competition behind him. It was just he and Musquin left to duke it out in the final moments, the two Orange Brigade members fighting over third. A mistake would let Musquin around, but Justin would still hold onto an applaud-worthy fourth place; his best yet of the season. As the series continues to roll on, many are eager for the tour to roll east, in favor of new soils and new scenery. With the swapping and constant rotation of cities, many a time riders hardly get anytime to reside in a respective metropolitan area. And knowing this, Chad Reed felt obligated to leave a lasting impression on the San Diego area. Taking in numerous sites around the town, he had the pleasurable opportunity to gel with many citizens of the area, including numerous military veterans in attendance. And with each passing handshake, it was as though a bit of morale would be boosted; rising steadily throughout the day. He could be seen saluting fans and friends alike throughout the opening lap of practice, almost as a signal that he was about to set sail into the stratosphere. Clicking the bike into pure overdrive, he became an absolute lunatic with some of the combinations he was trying to obtain throughout these hazardous conditions. No need for blinkers or turn signals of any kind, his pace was putting him well ahead of the field, although it was a rather short qualification round. Doing the job at hand, he would place his bike into the main event, eager for the night festivities to begin. Once the gate would fall for the heat race, he would immediately duck his head to the gas dank, using the visor as a shield, and head for the inside. Taking a deep breath as he crested the finish line on the opening lap, he knew he would have to remain calm as the moisture-ridden track would come to life. Trying his best to keep a smooth rhythm despite the adverse conditions around, he would try to seat the tire tread into the best line possible; hoping to not be weighed down by the gunk on the sub-frame. Powering forward and pulling away from Vince Friese, he would bring home a seventh place effort. He would rummage his way through the opening lap of the main event sitting sixth. And with garbage all around, it was only a matter of time before the crowd of combatants around would begin to fall. Yellow flags would then be flown, and he would have to choose the option of simply “sink or swim.” Would he succumb to the skies of above? Or choose to launch his way into the top five? And the latter would be selected, slaughtering the soils beneath as he kept the machine as light as possible. It would be enough to pull away from Aaron Plessinger, and secure the fifth place spot for an overall. As crews would prepare for this so-called “mudder” many teams were equipping the bikes with every defense mechanism possible, in hopes to safe guard their bike to the fullest extent. Whether it was foam under the rear brake pedal, or netting over the course of the radiator fins, all that could be done, was placed into effect. And seeing the effort his mechanic was placing into the bike, Aaron Plessinger felt reassured of the machine beneath him. Therefore he put all of his ability into his practice rounds, showing all in attendance that he would be a force of reckoning as the evening progressed. Launching every combination possible, the top ten or so were inseparable, with everyone throwing their name into the hat for contention. He did look rather fast in the chicane section, where he would arc the corners at the absolute perfect angle; never once displaying a line of jaggedness or obtuse construction. He knew this race would be a matter of milliseconds, and if he could gel the entire course together as a unit, he would reap the dividends, as the final flag would fly. Situated into his loading dock for the heat race, he would get the engine warm with a soft idle of sorts. Quickly throwing caution to the wind, he would blister out of the gate, and bolt down the start stretch, a snakes path of sorts following his tire tread. Inching his way towards the front of the field, he would reside around the second position in the early going. Doing his best to pull away from Kyle Chisholm, his competitor was showing no sign of slowing down as the laps would accumulate. He would move forward, taking advantage of Bogles mistake and inheriting the lead; yet Tomac was on the move. Eli, displaying a threatening pace, would push the Yamaha rider to second, where he hoped to stay. Luckily, the timer would stop within his favor; and the final black and white sheet would be thrown, resulting in a second place. Looking to showcase a phenomenal effort in the main event, he would hover near seventh to begin. He could see the leaders of Eli Tomac and Justin Bogle in the distance, and feel as though he could continue to gauge if he was granted a clear path. And that’s when the solid laptimes would begin to flow, where consistent circuits would seemingly mimic each other with every passing round. Keeping his weapon upon the hip, he knew he would have to continue to uncork the rather large tripling combination in the far rhythm lane; if he would keep Joey Savatgy behind. And his wishes would occur, hitting each of his marks in a sound manner, his efforts would be rewarded with a sixth overall. As the forecast preluded an abundance of rain to hit San Diego in the surrounding area, many in the industry were a bit nervous of just how the track would appear. Luckily, the crew at Dirt Wurx had the canvas covered from head to toe, hoping that any moisture hitting the surface, could simply slide off into the surrounding concrete. And it would do its job for the most part, creating a rather salvageable exterior, as the soil beneath would become extra deep. It allowed lines to be made upon instant, and an environment that Joey Savatgy flourished in. He believed the rougher the track, the more his skills would come to light; and that was apparent throughout the realm of qualification. His inside footpeg would be absolutely carving up this San Diego course, like a razor-sharp knife and Thanksgiving turkey. Focusing on gluing the track together in puzzle-esque fashion, his laptimes would reap the benefits. It was as though every lap, while others were stopping and starting, he would continue to climb up the leaderboards. It would create a rather cheerful mood throughout his pit area, as everyone in the inner circle felt he could do true damage in the latter part of the evening. Blitzing off the line to begin the heat race, his transmission would go through a staircase-sequence; up and down the levers of gearbox, one by one. It’s something he’d have to do, in order to keep the 450 floating at the right RPM. He hoped to conserve as much energy as possible for the main event, and his fluidity aboard the motorcycle was easy to spot. And something that would rattle Justin Barcia who was behind. He would viciously try to catch that of Cooper Webb, but the well-known pilot was flowing like no other. Never dabbing the foot, or appearing as though he would lay the bike over, he would corral his individual laps, into a third place performance. With the grate dropping shortly thereafter for the main event, he would push the pace from the get-go. Carefully doing his best to not burn the brake rotors, his coasting speed, and totality of momentum to be honest, was something to take note off. He was rolling among the rims of these bowl turns, with a gyro-effect of propulsion; sending him soaring into the following rhythm lanes with serene technique. It was an effort for the ages, as he would have to fight this layout lap after lap, steadily inching away from Cooper Webb for seventh. He would reside here at the conclusion, ready to take on the following round immediately. If you have the chance to scroll across any sports outlet or website here in the next few days, you are sure to find baseball news gleaming across headlines. One of the biggest moves of the past few years, seems to be on the horizon, with that of the phenomenal Bryce Harper, being involved to the San Diego Padres. Where as, as many of you know, plays host to the Supercross round in which we are attending. It’s made much of the mainstream crowd, (those who are new to the sport), filled with enthusiasm; translating over toward louder amounts of chants and screams, that were in echo of the coliseum all day. From the moment practice started, despite hoards of rain in the surrounding area, the crowd was ultra energetic; and something Cooper Webb could feed off of. And although not quite revving the throttle to the fullest capacity, he could be seen chopping the sound of the colossal motor in unison with attendee’s clapping. He made sure to put on a show, trying to display as much flare with his immense speed as possible. Although the bike would become a bit bulky toward the end of qualification, he was still flicking the machine as if it were a nimble piece of titanium. Exiting the arena, and back to the pit area, he was assured of the confidence well within him. As the green flag would fly for the heat race, he would do his best to keep the number plate clean. As the plastic had been coated with WD-40, the body of his machine wasn’t nearly as slick as his riding style around the track. Digging into the smallest of ruts, the way he could lean the bike against gravity was rather phenomenal; holding onto the slightest of edges as he pushed the bike through these grooves. Keeping an ultra-consistent pace, he would stay ahead of Joey Savatgy, finishing third. With the pack funneling into a solid flow for the main event, he would emerge from the derby of destruction, in the twelfth place position. He would have to keep his visor down as he heralded through traffic, with an occasional lapped rider beginning to appear even in the beginning. With bikes and body temperatures alike beginning to run a bit high, he knew he would have to persevere everything in his arsenal. Webb, on a charge to the front, was right on the edge of Baggett’s rear fender; and the two were conjoined in a rut after the finish line. Webb, being the challenger that he is, would nearly bump Baggett out of the way; only to jam on the front brakes, going into an endo of sorts! Not losing too much time, he would eventually remount and catch back up to the KTM, making the move on the number four. The stadium floor beneath him would begin to rumble and vibrate, almost if trances of tremors were beginning to seep through. But he couldn’t let even a thought enter within the shell of his helmet, as Baggett would take advantage and overtake him, despite the sequence that had just ensued. Luckily, he would persist to the finish, taking eighth overall. ​As the series heads to one of the deepest metropolis’ within California territory, the word around town is that the United States Border Patrol is carrying out an immense search for a few particular Supercross riders. And in particular, that of Tyler Bowers; as he’s been accused of theft-like occurrences, taking top ten finishes in a stealth like manner. One after the other, he seems to hide below the surface of many industry attendee’s, making sure to dodge the limelight and lurk within the shadows. Never one to draw attention to himself, his odyssey of ransacking top-tier finishes was of no surprise for the 2019 San Diego round of Supercross. With forecast showing a plethora of moisture for this particular race, he would come prepared, armed head to toe in combative gear. Stacked with multiple pairs of roll-offs, and tearoffs as well, he would try his best to navigate the treacherous terrain throughout qualification. Hoping not to trip off any alarms, grabbing the attention of opposing team owners, he would remain upright in the midst of the round; doing his best to simply, blend in with the pack. But as the heat race approached, he knew it would be time to bust through all locks, monitors, and data blockers, putting all of his might into a totality of security breaching. Making sure to keep his prints as clean as possible, he would round the first few laps in the fourteenth position. He wanted to leave a trail that was untraced, so you could see his outlying lines, in contrast to the normal groove that was being ridden by the rest of the field. Splitting the turn just after the “SX” triple with a pivot at the apex, he would try his best to walk the tight-rope of ruts, through the following whoop section; jumping as many as possible at one time. Coming across the stripe, his seventh place finish would place him into the main event. As the field would try to situate themselves in the early going, he looked to nullify all advantages with a solid starting outing. Weaving in and out of the chicane section near the start, he would try all possible combinations, in attempts to cracking the code of the ever so lustful, top ten. Looking as the sight would become clearer and clearer, the moment the final siren would sound, he knew he would have to dash away from Vince Friese. Hitting the on-offs after the holeshot line, he would hug the following right-hander tightly, just before the rhythm lane. This would be enough, as he crossed the checkered flag tenth, holding the competitions ransom with an ever-loving grip. Despite having a series of hiccups early in the season, the number ninety-two of Adam Cianciarulo has really began to turn the tide, and continue to ascend with the passing of each round. Dealing with his contenders seemingly almost every lap on the tour, Cianciarulo’s maturity is beginning to blossom as he accumulates bundles of laps at the front of the field. And despite growing up in Florida, being the true tactician that Adam Cianciarulo is, he’s been able to adapt to any scenario placed in front of him; including that of the mud here in San Diego. Putting in sound laps through the entirety of practice, he knew, through the process of visualization, that he could generate a solid result by the end of the evening. The law of attraction would then come into play, for the portion of the night titled “heat one.” Although just behind Dylan Ferrandis off the start, he knew if he could pace the Frenchman, that he could justify the pace in which he would have to set, to win the main event. Staying within striking distance for the entirety of the race, Cianciarulo felt strongly that he could conquer anything put in his way, taking second once all was said and done. The start of the main event was nearly executed to perfection, as the number ninety-two would have the Kawasaki soaring over the finish line double. Flowing in a smooth manner around the following chicane, you could see him maneuvering the 250f below him with precise body position. He would never put too much weight aboard the gas tank, or front end, as the tire could wash away otherwise. Launching the “SX” triple every lap, along with missing these lucrative potholes and ruts that littered raceway, he could be seen concocting a formula that was a true recipe for success. Each lap, the gap would be lengthened, sector-by-sector pushing him forward with his teammate behind. Moisture, now beginning to fill the crevices of his tearoff’s would begin to accumulate; yet his vision and focus would remain forward, never wavering despite the surrounding circumstances. Cianciarulo, taking the final left-handed bend, would be filled with excitement; knowing that he made a huge stride in the championship, with this race win. Seemingly blitzing through the amateur ranks, Garrett Marchbanks followed a process that his predecessor’s had set before him. As Geico Honda started the trend many years ago, he too would follow in Kawasaki’s rendition of “plucking matters” seemingly forgoing much of his pro-am career, and straight into the lights of Supercross. But Mitch Payton hasn’t accumulated numerous titles and race wins, without a keen sense of reasoning behind his moves. He saw a light in Marchbanks, and felt as though he was prepared as any, to start the grooming process in 2019. Coming through a series of ups and downs thus far, it seemed as though it would all come together for the round of San Diego. Navigating through the mud of practice to the best of his abilities, he would be penciled in as a contender for the sector of heat two. But the start couldn’t be too any more of his dismay, coming across timing and scoring in sixteenth. This moto could pretty much be tossed to the trash, as he knew in regards to the circumstances, that there wasn’t much of a way in order to qualify; he would then come to the LCQ locked and loaded, ready to complete the task at hand. He would do what was asked, get out front early, and received a bid to the main event. There was no question that he could handle the disadvantageous conditions, if only he could repeat the performance in the commencement of the main event. Managing a spectacular start despite his unfavorable gate choice, he would make the sequence work, and actually push his way into third by lap three. All over Dylan Ferrandis, he would make the move on lap five and absolutely continue to blister the track below him! Hitting every jump with ferocious intent, he decided to chuck the goggles around this time, and go into a pure warrior-like mentality; he would use Adam Cianciarulo out front, as a gauge on his speed. He saw his teammate out front, and felt as though it were just another day at the practice track. Marchbanks, still in the second place position as laps winded down, felt he could complete the process with a bit of self-belief, knowing that he had many supporters wishing him good vibes from the stands. With mechanics of opposing teammates cheering him on from behind the crew area, Marchbanks would rally for second position! The team couldn’t have been more ecstatic! Ask any rider, fan, and industry member alike, who the most popular rider is in the 250 class, and Jimmy Decotis will most certainly be atop the list. Known for his rather stellar amateur career, especially within the confines of the Northeast, coupled with his sensational two-stroke Youtube videos, and Decotis has all the makings to be a crowd pleaser. Not to discredit the amount of true speed the twenty-seven year old possesses, but the guys at JGR know what type of return on investment they are getting when signing the number sixty-four. As previously stated, being a native of Peabody, Massachusetts, Decotis has become accustomed to adverse conditions; taking the deepest, most treacherous soil compositions, and becoming willing to attack them with absolutely no hesitation. So, when the tarp was unveiled to uncover the track here in San Diego, you best believe Decotis was first to the line terrorize the stadium floor. Positioning himself into the night festivities in solid fashion, Decotis would climb behind the gate for his heat race, ready to “show-out” for the crowd. Fourth to begin, he would fight viciously with the KTM of Jess Pettis, as the two followed the leaders of RJ Hampshire and Colt Nichols. Decotis, sliding the rear wheel into the apex of these bowl turns, was riding the clutch rather aggressively, showing no mercy to the fibers that sat within his transmission. It would volley him past the KTM pilot, yet just a bit short of the two contenders in the front of the field. That third place alone, would leave him salivating as the thirty-second board would rise for the main event. Sixth to begin, he would work his way into fourth by lap four, taking advantage of the mishap of RJ Hampshire and moving past Jess Pettis in the process. He would sit comfortably here, doubling through the far rhythm section, and hitting the “SX” triple with every go around. Seemingly simple tasks to some, when the course was dry that is, proved to be staples in tiers of finishing position on this particular Saturday night. He would hang onto the fourth place spot, until an unfortunate mishap to the Yamaha of Ferrandis would push him into third! The 250f machine of the French pilot would be pushed off of the track, and unable to move. Decotis, now third, was in a bit of disbelief as he crossed the finish line. Things had fallen into his favor, and to his amazement, received a podium bit upon exit of the track. Being as composed as anyone else in the series thus far, McElrath knew that this round in particular would be extremely important in regards to the final championship standings. One little hiccup in the wrong portion of the race, and he could literally feel as though the championship would slip away. But he would attack the track with a portion of controlled rage, blazing throughout the slop in the practice rounds. And although it may not generate in regards to final result, it did bolster the confidence of the number twelve as he made his way into the night show. A crash on the first lap had McElrath fighting for a transfer spot, and he seemed to be having a hard time fighting his particular groove. One mistake after another, had him going off the track at times, and pushing the bike through the mud with his boots being the source of propulsion. It would be absolutely devastating to the crew at KTM, as they now would be forced to go to the LCQ, and risk not making the main event. McElrath would prevail, making sure not to tip over and do whatever was necessary as the field stormed out of the gate. Sitting in second behind Garrett Marchbanks, he figured he was best off residing in the runner-up placement, rather than risking a crash going for the lead; therefore second is where he would stay. Nineteenth off of the start on the first lap, he was forced to work his way from behind after a tussle with the San Diego soil. McElrath’s composure would come to light, as many would freak out with a voice of uncertainty; yet the North Carolina native would battle and fight, keeping the heart rate at a rather tranquil level. Pushing up to the back of Jimmy Decotis’ in the final moments, a wave of reassurance would come over him as he saw the number thirty-four machine of Ferrandis on the side lines. Never wanting to be the recipient at the misfortune of someone else, he would accept what had happened, and take fourth place at the line; knowing that he had secured serious points from what first was a disastrous day. This championship would be a true showing of attrition, and McElrath knew that his average placing would mean much more than the highs and lows of the ultra competitive 250 West Coast series. ​With riders like Blair Morgan, Jean Sebastien Roy, Colton Facciotti, and even the present Cole Thompson making storied runs throughout the likes of American circuitry, Canada’s own Jess Pettis looked at the 2019 season as an opportunity to etch his name into the record books for the rest of eternity. Getting picked up by the Factory KTM team of Canada, he knew he would have all resources necessary to do well, if he could adapt to the realms of Supercross. And it’s as though at every round, he’s seemed to visually appear more comfortable, and his results are reflection of that. Getting the timing of his rhythm sections, and throwing his hesitancy of “whoop blitzing” to the rearview, the number 160 has now labeled himself as a serious contender in the 2019 West Coast Championship. After making his way through the short practice sessions, he would line up for the heat race ready to compete. Third on the first lap behind the likes of RJ Hampshire and Colt Nichols, he would try to watch the heavy hitters to the best of his ability. Staying just outside of roosting distance, he was in an optimal range of viewing his opponent, yet keeping out of harm’s way. He would however have to deal with Jimmy Decotis near the halfway point, and the veteran would subsequently work his way around. His pace wouldn’t flounder then, however, as he would march the number sixty-four down, almost contending to make another pass back. But in true, veteran-like fashion he would take his sleek looking KTM across the finish line in fourth, ready for the main event to come. An exceptional start would be on the menu for the main event, coming across timing and scoring in second! Contending with Adam Cianciarulo, he was doing his best to launch every double possible; even the treacherous “SX” triple at times. Finding a strong combination of doubling through the rollers leading up to the finish line, he would use both brakes adequately to stop this powerful 250f (although it was under a heavy load with all of the mud now attached). Battling with the likes of Jimmy Decotis and such, he would find his way into fifth with just a few short laps to go, yet he had series contender Shane McElrath at his door step. And although suited in orange himself, there was all types of friendly fire coming from the back of Pettis’ and he tried to stop the charge of the number twelve. It would prevail, as Pettis would claim fifth for the evening! Coming into the round of San Diego, Dylan Ferrandis was downright determined to make a pivotal run at this championship. Being within striking distance of the points lead, he knew with solid starts, finishes, and a little bit of luck on his side, that he could obtain the red plate in the foreseeable future. Being a native of France, Ferrandis felt adequately prepared, that he could adapt to the woes of Mother Nature. As the forecast had been heavily disfavored by much of the industry, in the days leading up to the event. Knowing the speed he showcased at Anaheim One, meshed with his results in GP events of the past, everyone across the betting lines penciled Ferrandis in to be a sure favorite. After navigating a few laps of practice, he felt a couple of sprints were sufficient, in regards to getting his name into the heat race sector of the event. Shortly thereafter, in the hours to come, he would load the Yamaha YZ250f behind the gate, ready to go for the heat race. With the mechanic scrubbing the tread of his tire, he would fire up the engine, awaiting anxiously the opportunity to bombard aboard this ravine that awaited him. Getting out front early, he very well may have been the only rider the crowd could recognize. Not only because of his outright speed, but his attire and number plate were the only one’s legible! With the field absolutely splattered in gallons of absolute muck, Ferrandis knew he was in the absolute right spot, to gain a wave of momentum. He would go onto lead every lap, keeping Adam Cianciarulo at bay. It was then time for the main event, where he would be situated early behind Jess Pettis and Adam Cianciarulo, in third position. Moving into second by the halfway point (with a now condensed format), he hoped to pounce on the ninety-two machine whenever possible. Dealing with the likes of Garrett Marchbanks, the number sixty-one would make his way around with the laps winding down, gaining substantial time in the rollers before the finish line. Ferrandis, looking as though he had third sewn up, would come to a screeching halt on the final lap! A bike malfunction would force him into seventh position, as the leader had lapped everyone to that point. Devastated, Ferrandis would be as determined as ever for the next round. 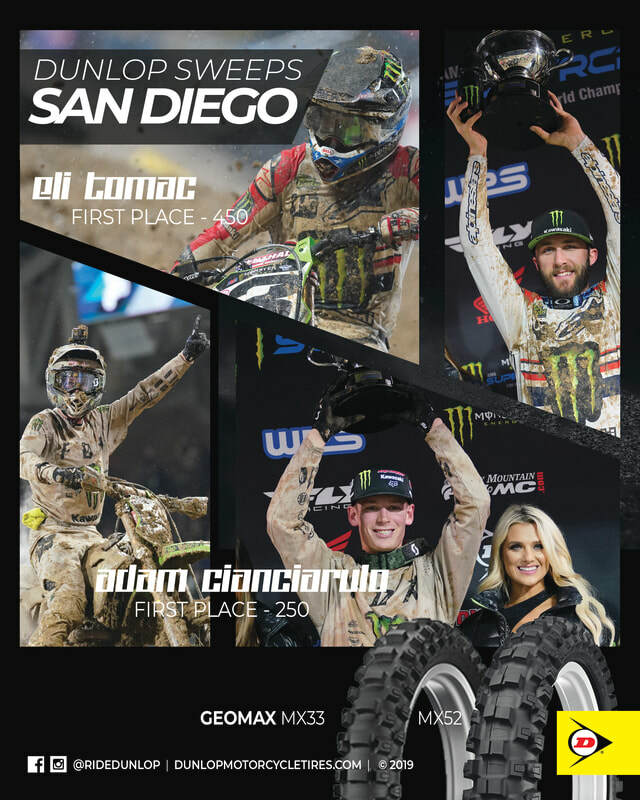 ​With newspapers and media outlets of all kinds gleaming, “Survival of the Fittest”, the San Diego Supercross of 2019, sure was a spectacle that would go down in the record books in infamy. Covered with torrential rains, this may have been one the muddiest races in Supercross history, with an open stadium being the outright victim of a gigantic front on the west coast. 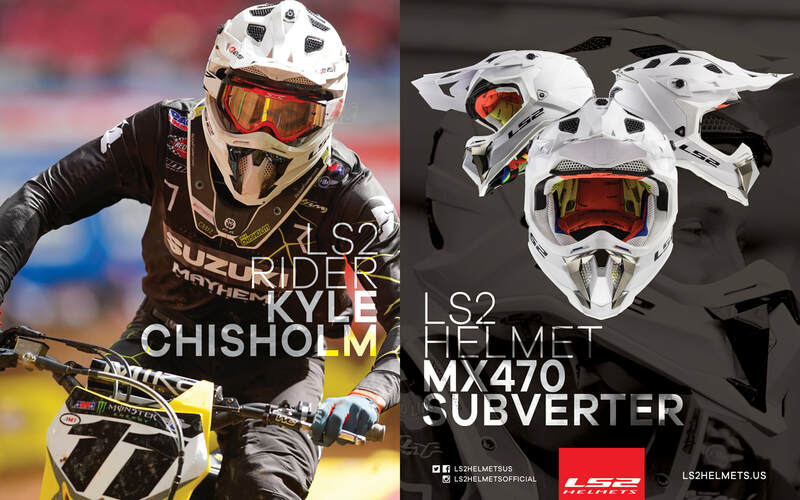 But, as a Supercross racer, you must be prepared for any type of condition; and Mathias Jorgensen knew what to expect, upon arrival to the event. Covered in head to toe in specialized gear, he would climb aboard the bike for practice, just hoping to turn one solid lap. He knew he wouldn’t have to piece together an entire duration of racing, merely just one circuit to get him into qualifying. He would complete the task, but due to unforeseen circumstances, choose to focus on only the Last Chance Qualifier and not the heat race. Circling the first lap of the LCQ in fourth, he knew the matter was of staying up, and nothing else. Every lap, seemed as though it were an accomplishment in itself; as the ruts would continue to get deeper and deeper. A pure battle of attrition, he would try his best to keep the throttle grip clean, as any type of water into the assembly could cause malfunction or deter in grip. Hovering near the third place ride, he eyed the checkered flag as a golden relic, anxiously waiting to just rally the machine over the final line. Doing his best to navigate through the opposing whoop sections, he would round the final left-handed bend in third place, making the main event. With the field bottled up yet again, he would come across the line in seventh for the opening rounds of the main event. Looking to move ahead, he knew he would have to ease on the clutch in a precise manner, otherwise the bike could be a ticking time bomb so to speak. Pushing forward, he would pull from the likes of Chris Blose and Carson Brown behind him. He would start to fade toward the outskirts of the track, as the inside ruts were getting to deep to even decipher, much less power through. With the clocking ticking down, the eighth place would be secure, where his name would be etched in the record books. With riders such as Jeremy McGrath, Ricky Carmichael, and other superstars in attendance, Cameron McAdoo wanted to put on a performance for the ages. He hoped that he could solidify his presence inside the top ten, letting everyone know the amount of speed and true grit he possessed. He took the opinion of his peers and elders seriously, and at the end of the day, despite the entire glamor that comes with winning and achieving milestones; he wanted respect. Therefore, from the moment his tire tread laid imprint on this mud-ridden track, he looked to put his best foot forward, without being stuck in sea of complacency (also known as the muck of San Diego.) Conserving the motor as much possible, he didn’t want the team to have to configure any new types of schematics, or swap parts internally. He liked the package his current chassis housed, and would do everything in his power to keep the bike afloat, both figuratively and literally. Coming into the heat race, he felt confident he could qualify for the main event, if he would just get out of the launch pad with decent positioning; and he would do so, working his way into the seventh position early on. Timing was of the essence, with the field literally being stopped in their tracks with the pure amount of mud that was on the course. It was an all out war, he versus the mud beneath him. Hugging as many insides as he could, he would take a subtle look over his shoulder; only to notice a figure of pure mud and moisture behind. There was no way he could tell who was who, and decided to motor forward, as any energy focused behind, would be wasted. Doing his best to launch the notorious “SX” triple, it was a matter of getting to the checkered flag; he would come across the line fourth. For the main event, he knew he would have to conserve both bike and body as much as possible. Launching over the finish line double to the best of his ability, he would duck to the inside, hitting a couple of deceivingly strong lines near the start stretch. With the bike smoking, after running through the vast amounts of water on the track, he yearned for the halfway point; he would sit twelfth. Each lap, he would put just a bit of length on Chris Blose behind, vaulting him to the ninth place position; it was here where he would stay, securing a spot inside the top ten. When looking at the forecast and in later sequencing, the raceway of the 2019 San Diego Supercross, many in the field were debating on just how hard to ride their bikes; in regard to the swamp-like conditions that would be displayed. Risk ruining your motor, all of your valuable parts, and become in debt monetarily, for the illustrious dream of a top ten? While many would call this crazy, riders like Colt Nichols looked to seek and destroy whatever particular path was placed in front of him, never letting a few sprinkles deter his dream. He managed to get through the practice sessions, albeit only a few short laps of sprinting time. He had a chance to learn the track, and the do’s and don’t(s) of the biggest water holes around the circuit. He knew when to duck and dodge, while understanding that there would be moments in which he would have to wheelie and power through. So come time for the heat race, he was all but ready to unleash his inner beast. As the rear wheel would slide around these ultra-slick surfaces, his throttle hand would remain steady, keeping the chassis below in line as best as he could. Fumbling with the likes of the clutch with any type of airtime, he would let the breeze of the California air cool his bike off whenever possible. In an array of shuffling, he could be found moving up the leaderboard, doing his best to keep the locomotive moving forward. With smoke filling the air, showing reminiscence of battle, he would do all in his power to pull away from Jimmy Decotis, while reeling in RJ Hampshire. The enemy would try to latch on, doing his best to avoid the roost, yet stay interlocked with the master link of his chain. But it was to no avail, as his constant movement in the forward direction would push the competition even further backwards. His end result, would position him second, just behind the Honda rider. He had to let it all hangout, regardless of the circumstances, as the main event was soon to begin. With track situation simulating that of a mud-bog, rather than a Supercross race, he knew he would have to let loose and provide a steady fury on the competition around him. Mistakes would litter his opening circuits, where a slip before the finish line him would have him just inside the top ten. Lingering around the tenth position near halfway, he knew he would have to display a strong sense of will power in order to not lapse in focus and let riders like Chris Blose around. He would rally, taking tenth at the checkered flag; you could see that he was visually upset, but after goggle malfunctions and mistakes that led to crashes, what more could you ask for? He was still within the title hunt as the series would move east.